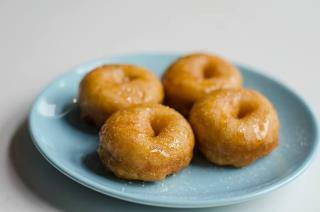 (Newser) – An Oregon doughnut shop is hiring—just not any vegans or vegetarians. A job ad for Pip's Original Doughnuts in Portland describes the ideal candidate as someone with "a friendly, outgoing personality," but "no non-medical, non-religious dietary restrictions" that "would stop you from tasting, accurately representing our treats, and maintaining quality control." Given that PETA recently named Portland as America's "most vegan-friendly city," the ad is not going over well, reports Oregon Live. "Won't return now that I know you discriminate against vegetarians," one customer writes on the bake shop's Facebook page. But co-owner Nate Snell isn't budging. "After receiving as much hate email as we have in the last two days, I'm more steadfast and sure of our position than ever," he writes. well, if part of the job requires you to taste the product, it makes perfect sense. Wow, what a shocker, liberals looking for stuff to whine about. How rare! Vegetarians don't eat animals, vegans don't eat things from animals. Some animals eat others. Some eat vegetation. What do vegetables Eat? Minerals in the earth. Is the Earth's soil dead or alive?